First, you can learn about the air pollution monitoring conducted nearby. 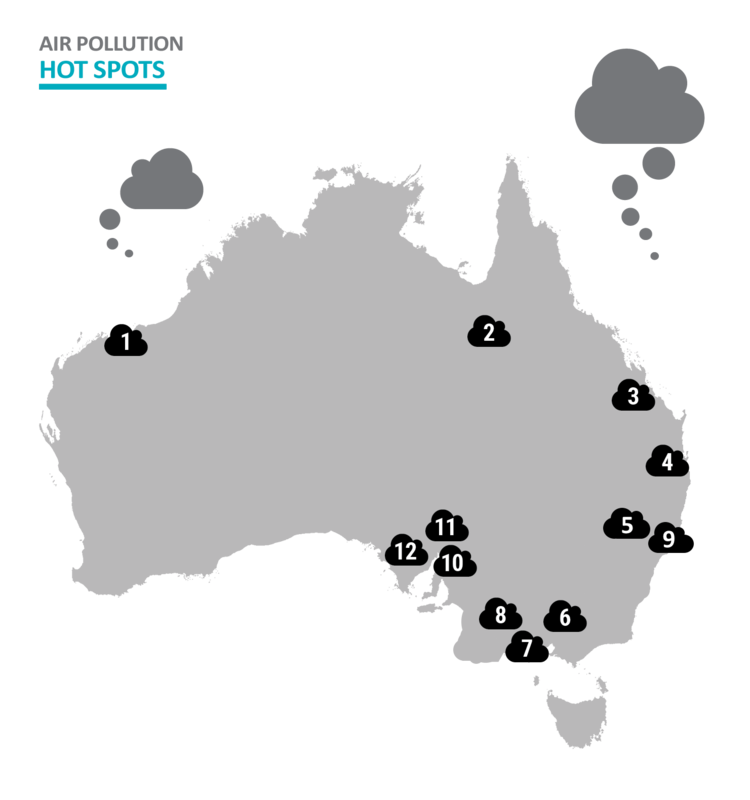 In Australian cities, the environment department or Environmental Protection Authority has a network of air pollution monitoring stations. Details about these stations and the pollution levels they record are available here. Second, the National Pollutant Inventory provides free information about emissions of 93 toxic substances. By searching the NPI site, you can identify major polluters in any part of Australia and learn how their emissions to air, water and land have varied year by year. Particle pollution causes serious health problems in Australia. Coal mines are responsible for almost half the nation’s total coarse particle (PM10) emissions each year, and emissions have doubled in the last five years. Coal-fired power stations are a major source of fine particle (PM2.5) emissions. In the Latrobe Valley, power stations emitted 4.3 million kilograms of PM2.5 pollution in 2013-14, more than 97% of the Valley’s total PM2.5 pollution. Pollution from iron ore dust regularly exceeds national standards. Hospitalisation for respiratory problems is 30% higher than WA average. Asthma mortality rates are 322% higher than the rest of Queensland. At least 11% of children have lead posioning. Community concern for years over excessive coal dust, alumina dust and other toxic air pollutants. 8.6 million tonnes of coal a year transported through Brisbane suburbs in uncovered trains. One of the highest PM pollution levels in Australia. The 2014 Hazelwood coal mine fire cause pollution 15 times the acceptable limit. Particle pollution exceeds safe healthy levels on numerous days each year. Worst air and dust pollution levels in Melbourne. Particulate pollution regularly exceeds acceptable limit. Coal terminals, coal trains, loading and handling. Coal export terminals and coal trains are uncovered in the world’s largest coal export city, creating a massive particle pollution problem. More than 3000 children have been lead poisoned in the last decade. Power stations are the most polluting in Australia. Lung cancer rates twice the expected number. Highest rate of childhood asthma in the State. Lung cancer rates are 50 times higher in Whyalla than similar towns.